You’re not here by a cheap chance. 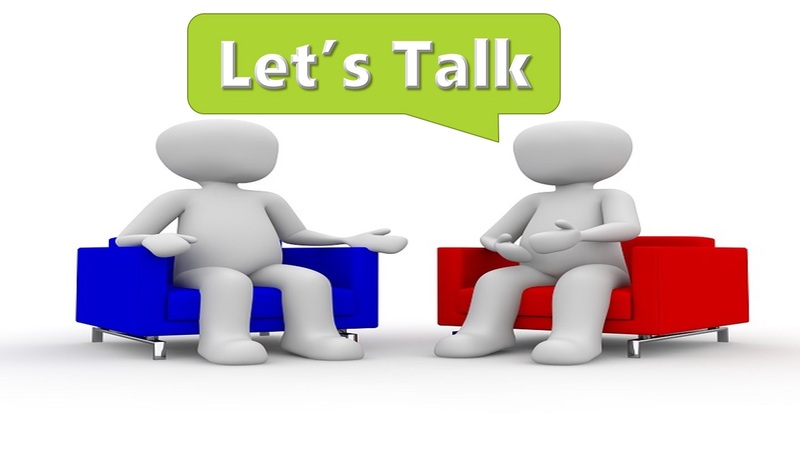 You need traffic or want an online presence for your business. Or there’s this inner drive that tells you to learn. Whichever category you belong, I’m about to burst your bubbles. Obviously, there are many SEO agencies out there who claim to be experts in the field but it’s unfortunate how there’s no shadow of a proof to back their overrated claims. If you’ve been a victim of their plots before, you already know they just read online and organize seminars with the sole aim of getting money from the ignorant ones. I know how it feels to be robbed of your hard-earned money for a program that yielded no return. It’s the height of fraud! 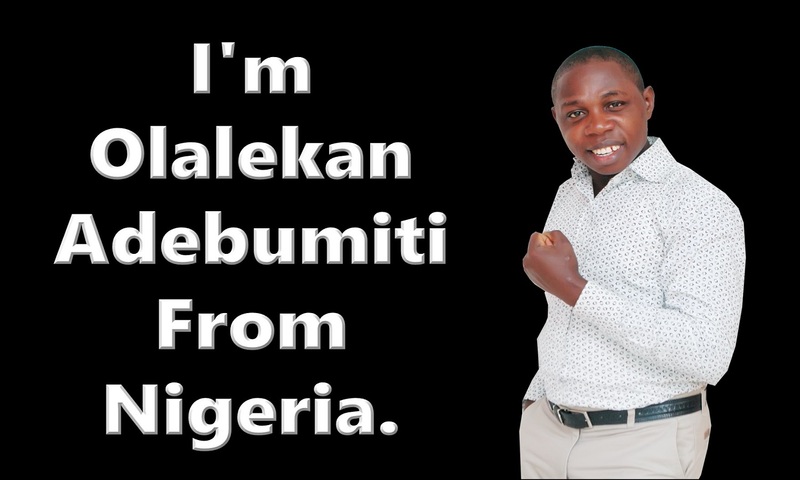 I’m Olalekan Adebumiti From Nigeria. I blog for a living and SEO is my meat! I started this SEO journey some years back and I’ve got amazing results to that. To say it as it is, there are months I don’t blog and my traffic doesn’t drop. The money also comes in steadily. If you want the proof, I will show you at the Venue. It’s my pleasure to duplicate same into you! Obviously, when you hear Search Engine Optimization, you want to see first page rankings. And if that is what you so desire, I will show you that in few minutes, even before you get to the seminar, so you know I am not proving what I don’t have a result for. Let’s go over to Semrush.com and see how Safejourneyquotes.com is doing. Wait, let me lead you to Google Webmasters Tool too. As you can see from the Video above, the site ranks on the first page for 999 keywords. It’s even more than that; Google only records the first 999. I expect you to talk about backlinks. But, no! A Backlink is the least of my worries. Do you think it’s Social Share? I don’t share my contents on social media. I just write, submit to Google for Indexing and the rest is traffic from over 200 countries in the world. Do you care to see the proof? See another website of mine. So What Will my Seminar Give You? Well, I’m taking you on the journey to teaching you everything I know about Search Engine Optimization. So come with a laptop (borrowed or owned). And, Why Do You Need SEO? It might be one of those funny questions to ask, but permit me to tell you that billions of searches are made through Google every day. And, you care to know the most visited site in Nigeria? See the Picture below for an answer to that. Yes, Google.com! 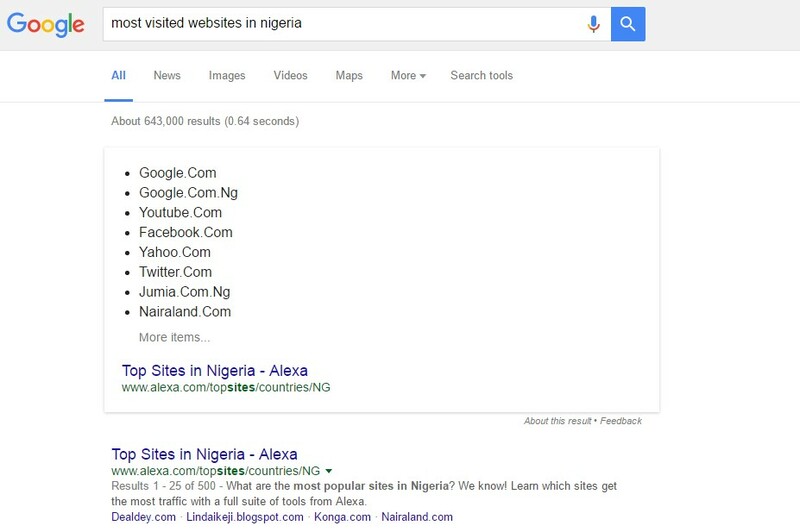 And the Second is Google.com.ng! Then, what if your business isn’t online, at the right spot where it should be? There is just one answer to that – You are not wise! You will lose a lot for that. You don’t need to share links before people visit your site. You need to put your business online for a maximum impact. The Traffic flows in, any time of the day. You need to silence competitors forever. You can have the time of your own and the money comes in whether you visit your blog or not. 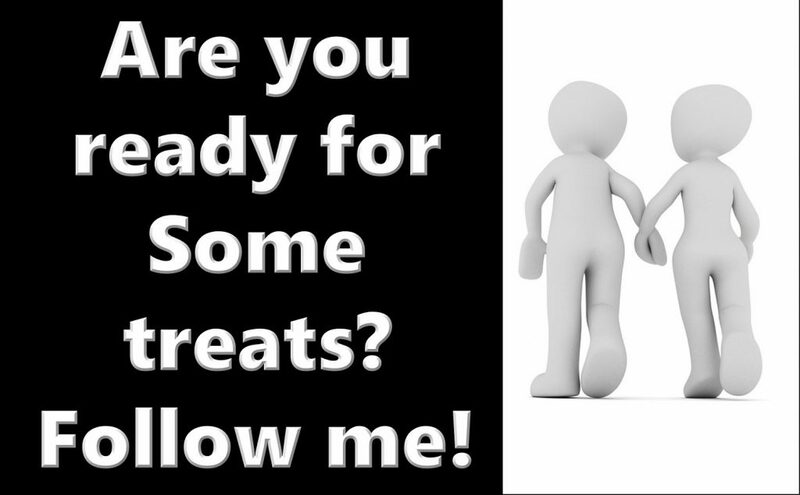 I’ll teach you how to grow your blog to survive in your niche. You will have the step by step guide to writing the post that can rank and be on Google’s first Page, using my “Baker’s Technique”. You have one month support, starting from the day of the training. Tech 24, Nikky Africana 1st floor, 70c, Allen Avenue, 1st Bank Bus stop, Ikeja, Lagos. Are you not in Lagos? Don’t Worry, I’m coming to Your City! You Can’t Make the Offline Version? An online version will also be available for those not able to make the offline version. I’m charging you #10,000 for the two days. 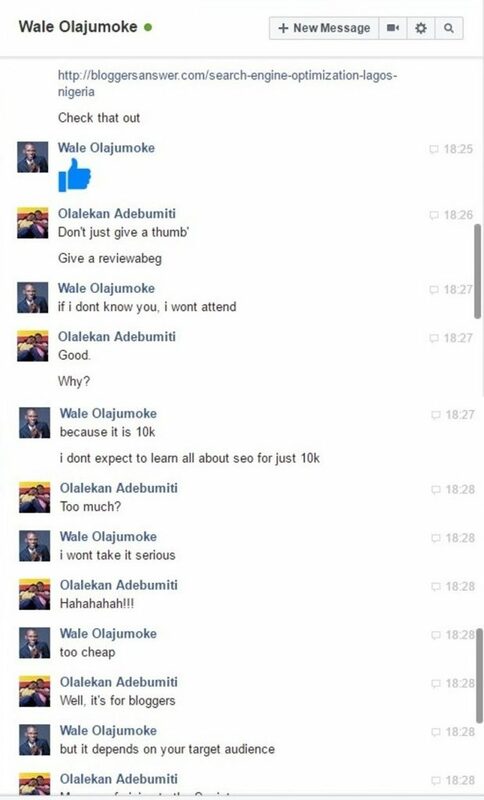 I had a discuss with him where he said #10,000 is too cheap to learn SEO. Actually, he’s right but it’s my way of giving back to the society; my way of helping the struggling bloggers. Then if you think you’ll get it out there for that price, you’re free to close this page and I’ll be sorry for making you visit my site. 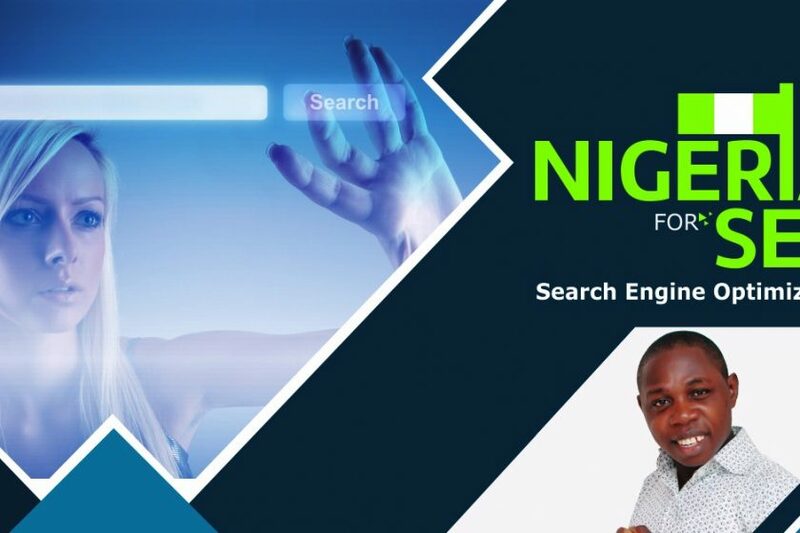 Now, the ball is in your court: It’s either you learn Search Engine Optimization now and begin to dominate your niche as you send your competitors off SERPs or you continue to struggle with your traffic and brand recognition until God knows why! Choose Wisely because this is the last time I will be doing this “cheapo” of a seminar.